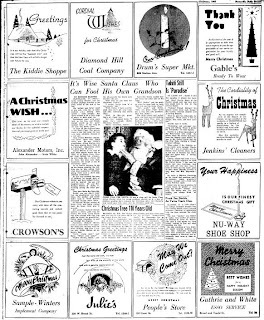 This week I transcribe a news story from the Christmas 1947 issue of the Statesville, NC Daily Record. 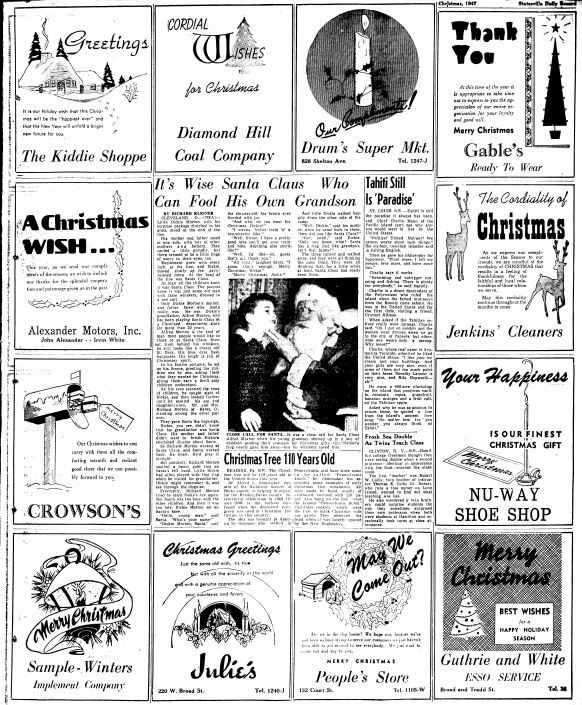 However, the news story was covered by the United Press Associations (forerunner of United Press International), so it appeared in many newspapers across the country, and this is just one of several copies I have found on newspaper databases. ST. LOUIS. (U.P) —Tahiti Is still the paradise it always has been, and Chief Charlie Maun of the Pacific island can't see why anyone would want to live in the United States. "Politics? United Nations? We cannot worry about such things," the six-foot, two-inch islander said in halting English. Then he gave his philosophy for happiness. "Plant more, I tell my people, love more, and have more fun." "Swimming and outrigger canoeing and fishing. There is plenty for everybody," he said happily. Charlie is a direct descendant of the Polynesians who ruled the island when the famed mutineers from the Bounty came ashore. He was in the United States and for the first time, visiting a friend, Cruvant Altman. When asked if the Tahitian natives really wore sarongs, Charlie said, "Oh I put on sandals and the women wear dresses when we go to the city of Papeete, but otherwise one wears only a sarong. Why more?" Charlie, whose real name is Aruieurira Terutahi, admitted he liked the United States. "I like your ice cream and your buildings. And your girls are very nice, even if some of them put too much paint on their faces. Dorothy Lamour is very nice, and Rita Hayworth—ah!" He owns a 400-acre plantation on the island that produces vanilla, coconuts, copra, grapefruit, bananas, oranges and a fruit called the Tahitian apple. Asked why he was so anxious to return home, he quoted a line from the island's ancient love song: "No matter how far you wander you always think of Tahiti." 1) Charlie's friend, Crvuant Altman, is the only connection between this news story and my family tree. Cruvant Altman was first cousins with my grandfather, Melvin Newmark. Cruvant and Melvin were law partners after the war, and I suspect Cruvant met Charlie during his service during World War II. 2) I do wonder about the accuracy of the almost stereotypical portrayal of the Polynesian islander. 3) I thought the presentation of the entire page with the advertisements and other stories made this a perfect choice for this week.